About 100 homeless advocates and residents rallied in front of Oakland City Hall Tuesday, imploring the city to improve living conditions in homeless encampments instead of trying to tear them down and evict people living there. Protestors also sent an open letter to Mayor Libby Schaaf asking her to stop ordering so-called "sidewalk sweeps." The action was prompted by the recent release of a scathing United Nations report on global homelessness that specifically criticizes Oakland and San Francisco for denying basic services to people living in street encampments. The report is based on a walking tour taken by Leilani Farha, the UN Special Rapporteur on the right to housing. Describing conditions at the homeless encampments as "cruel and inhuman," and comparing them to slums in the world's poorest nations, the report chastises both cities for denying basic services to people living on the street. "Attempting to discourage residents from remaining in informal settlements or encampments by denying access to water, sanitation and health services and other basic necessities constitutes cruel and inhuman treatment," the report said, "and is a violation of multiple human rights, including the rights to life, housing, health and water and sanitation." It added: "Such punitive policies must be prohibited in law and immediately ceased." Boden added that cities need to use different language to describe homelessness on their streets. “They have always insisted on referring to it as camping and lodging and encampment because by putting it in the context of camping, it sounds choiceful and it’s therefore okay to criminalize that activity,” he said. Earlier this month, Oakland opened a temporary homeless housing community composed of small sheds, located near Lake Merritt. It's the third "Tuff Shed" camp the city has installed since December. The city said it would begin enforcing a no-camping rule around the lake once the sheds were established, heightening concerns among residents of the growing encampment nearby. But no one has been forcibly removed yet, according to the mayor's office. 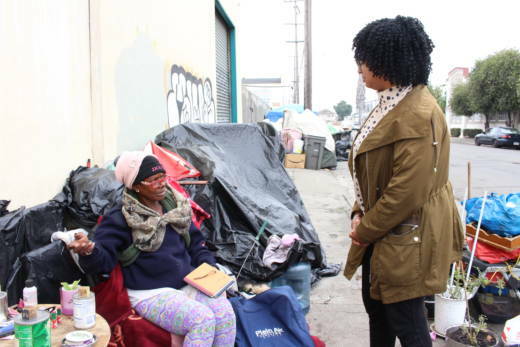 Candice Elder, who runs the East Oakland Collective, a group that offers services to homeless residents and hosted Farha in January, said the report identified a crucial need. “We’ve been pushing for a while for Oakland city officials to allocate more funds to sanitation and pick up," she said. "The whole community benefits, the more of us that are healthy, educated, well-housed, well-fed."